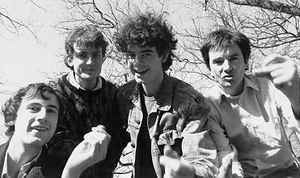 1980s New Zealand psychedelic/pop/rock band, led by Matthew Bannister, which recorded on the Flying Nun label. Initially recording with the line-up of Bannister (guitar), David Pine (guitar), Kat Tyrie (bass guitar) and Martin Durrant (drums). Sneaky Feelings reformed for shows in 2016. A new album was issued in 2017.